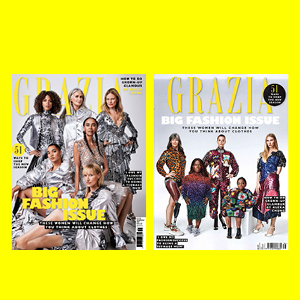 On Tuesday 18th September, in order to coincide with LFW, Grazia’s Big Fashion Issue went on sale and had split cover run on both newsstand and subscription copies, featuring models who are usually under-represented in the fashion industry. One of the covers featured models from the 20/30/40/50/60/70 age brackets, with the other cover featuring models with disabilities. The reason behind the campaign was for Grazia to continue to build on its ethos of inclusion and diversity, an issue that Grazia UK holds as great importance.